LEGO Star Wars III: The Clone Wars is a LEGO Star Wars Video Game released in 2011 by Traveller's Tales and published by LucasArts. It can be played on the Nintendo Wii, Nintendo DS, Nintendo 3DS, Playstation 3, PSP, Xbox 360 and Windows PC. The game was first announced on February 8, 2010, and follows the events of the ending of Star Wars Episode II: Attack of the Clones and the first two seasons of the Star Wars: The Clone Wars TV series. Several new features were introduced, such as head-to-head player combat, as well as new abilities like lightsaber slicing and squad command. Like past LEGO games, players control minifigures, controlling them to make them run around, jump, and attack enemies. Most characters, in addition to attacks and weapons, also have additional abilities, such as grappling or using the force. Players may play as one character at a time, switching between the available characters. Free Play, made possible after completing a level in Story Mode, also allows switching between any character currently unlocked and bought. There are 20 story missions and 40 bonus levels to play through. Through playing the levels and bonus missions, players also unlock gold bricks. A gold brick is unlocked when a level is completed, when all minikits are found, and when "True Jedi" is achieved. 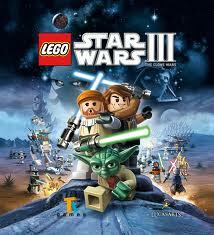 The game includes characters from both series of the Clone Wars, as well as some from the rest of the saga. New character abilities include squad command, lightsaber slicing, lightsaber jumps, long distance Jedi attacks and grapple tie-ups, picking up droids, and stepping on certain pads in which Jedi perform "combo moves" to destroy certain objects. The game also features an updated character creator, allowing players to make their own characters. Like the other TT LEGO games recently produced, the game features an easy to navigate "central hub", where players can choose to purchase upgrades and select levels to play. The hub for LEGO Star Wars III is the Star Destroyer Resolute, though the player also has access to the Invisible Hand at some point, where they may find sith- and Separatist-oriented characters and missions. Players cross between hubs using ships, and in doing so, may also partake in space minigames with the starfighters they purchase. In addition, gaining gold bricks unlocks new areas in each hub. A new feature included in the game is player-versus-player combat, where each player will build LEGO bases and defend them. Vehicle levels have also been upgraded slightly. Now the player can land their ship and begin fighting on foot. The game is to be considered the most detailed LEGO game ever to be put into production up until that point. Details include being well polished with realistic lighting, shadows and textures. The game has sharper graphics and can render over 200 characters on screen at once. Best Buy offered a demo of the game, presenting the choice of two different levels from it. An Xbox-360 demo was also released on 2/22/11. The cover for the Wii platform. Yoda fighting Battle Droids on Rugosa. Clone Trooper Jek with a Z-6 Cannon. The Malevolence in a space battle. Kit Fisto, Captain Rex and Nahdar Vebb fighting Gor. Another shot of Kit Fisto, Captain Rex and Nahdar Vebb fighting Gor. Obi-Wan and Anakin Skywalker possibly in the Malevolence. Obi-Wan, Anakin, and R2-D2 possibly in the Malevolence. Obi-Wan and a Clone aboard the Resolute. Obi-Wan and a Clone on Rugosa. A Clone Trooper on Rugosa. An AAT and 2 Battle Droids on Rugosa with a minikit. A Clone Walker on Maridun. A Clone Trooper near a computer. A Clone Trooper being fan elevated. A Clone Trooper next to several boxes. Anakin fighting off Battledroids and the Acklay at the battle of Geonosis in Episode II. Ahsoka jumping off from the Twilight. Commando Droids on the Rishi Moon. Anakin using the Force aboard the Malevolence. The Lurmen villagers from Maridun. Orn Free Ta and Mace Windu at Wat Tambor's arrest. Captain Rex and Commander Cody from "Rookies". The Republic Shuttle on the Rishi Moon. Anakin slicing through a door. Asajj Ventress and the Toydarian King, King Katuunko. The Trade Federation Command Ship. Captain Typho and Queen Neeyutnee. Yoda and Clone from "Ambush". Yoda and two Clone Troopers. Naboo Cruiser in the Theed hangar. Super Battle Droids flying towards a Star Destroyer. Ahsoka Tano and Rex next to a crashed Republic Frigate on Maridun. Anakin riding on a Reek. Plo Koon flying by the Malevolence. Plo Koon aiming a Proton Torpedo. Anakin Skywalker and Wulff Yularen. General Grievous on the Malevolence. Anakin fighting off two MagnaGuards. A Split Screen play example. A Battle Droid and a Super Battle Droid. Asajj Ventress and a group of Battle Droids on Rugosa. An Escape Pod falling on Rugosa. Yoda and a Clone within an escape pod. Seperatist Starships attacking Republic ship. Anakin Skywalker and Ahsoka Tano on the battlefield. Captain Rex facing Battle Droids. Asajj getting mad at the Toydarian King. Anakin and Padme moments before the execution. Anakin falling in love with Padme. Anakin and Padme arriving to the arena. The heroes moments before the execution. Jango Fett offering his son ice cream. The Geonosis monsters at the execution. The death of the Nexu. The Separatists angry over the Nexu's defeat. Mace Windu surprising the Separatists. Barriss Offee surprising the Geonosians. Nadar Vebb and Possibly Clone trooper (jek) Fighting Grevious's Roggart. ↑ StarWars.com - LEGO Star Wars III: Old Ben Revealed! ↑ 20.0 20.1 StarWars.com - LEGO Star Wars III: Darth Sidious Revealed! Facts about "LEGO Star Wars III: The Clone Wars"